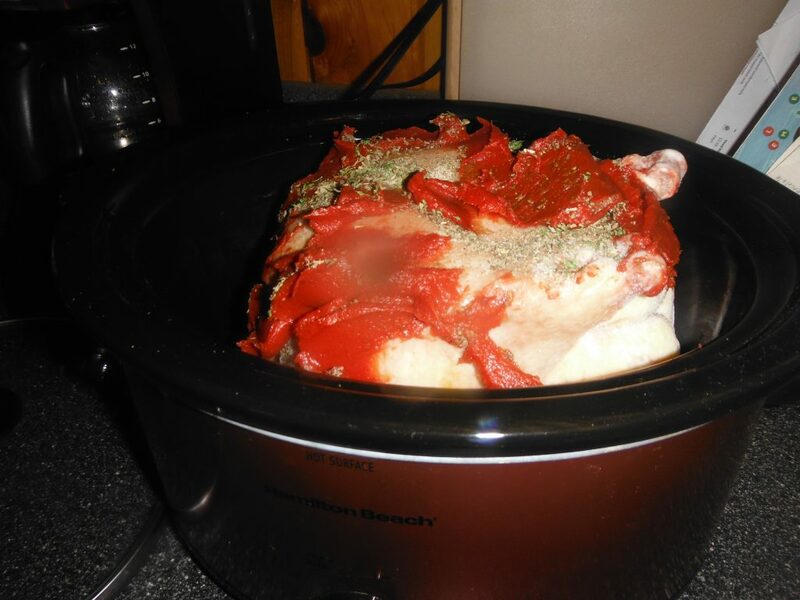 This easy Italian Crock Pot Chicken is a good stand alone or use it as a base and add your favorite veggies or fruit for a complete one dish meal. Oh who am I kidding? You start with the best you can afford or what you happen to have. You can make a delicious meal out of just about anything really. The key is knowing what flavors lend well with each other. I always start with our protein and build our meals from there. And in that regard, because we raise our own, our protein is the finest. So there! 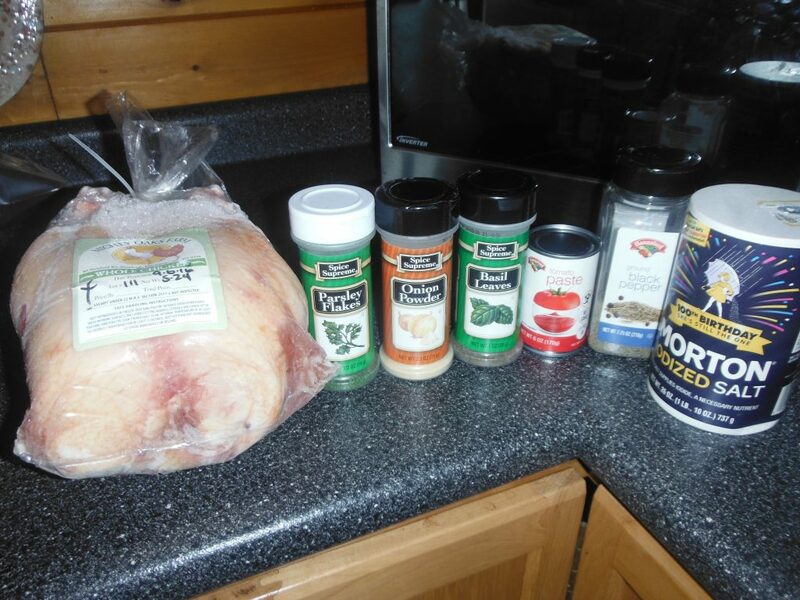 Place your whole pasture raised chicken in your crock pot. Mine was completely frozen, but thawed will work just as well. 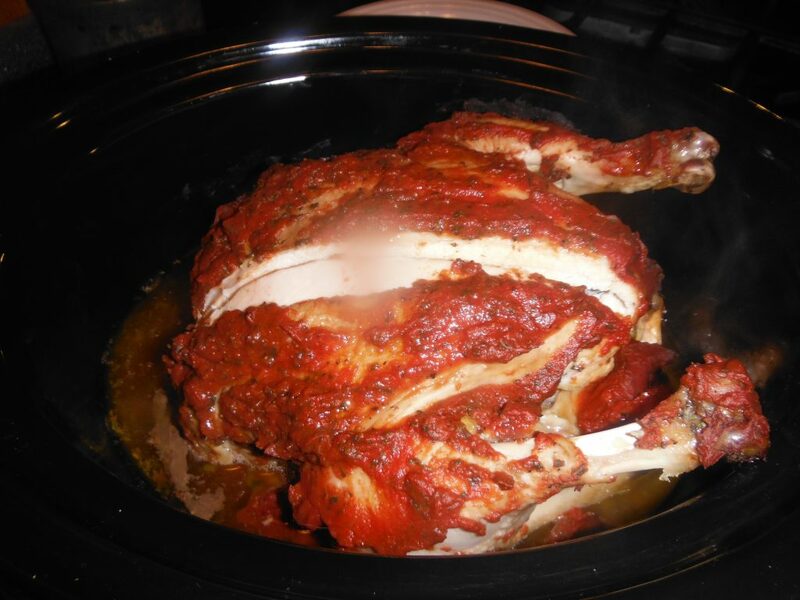 Open your can of tomato paste and rub it on the top of your chicken. No fancy tool or technique required. There is nothing I do that is difficult. Just spread it on there. The idea is that this paste will create a moisture barrier, while allowing the flavor of the tomato and seasoning to be absorbed into the chicken. Next, shake-shake-shake, shake-shake-shake, shake your… oh, never mind. That was a fun flash-back to 1976. And now that the dance party is over, it’s time to get back to the cooking. Be generous with the seasoning. No measuring required. Just shake a good amount of each on the top of the chicken. The only spices you could possibly go overboard on is the salt and pepper. But believe me, you would really have to do more than a few shakes to make that happen. Next, put the lid on the crock pot and set on high if it is a completely frozen bird or put it on low if it is a thawed bird. 8 to 10 hours later, you will have the main part of supper ready and waiting for you. Don’t forget to plug in and set the temp on the crock pot. Miss that step and the chicken won’t cook and you will be disappointed come supper time. Ask me how I know! Now that your main dish is out of the way, add a salad and some rice. Or some corn meal muffins and green beans. 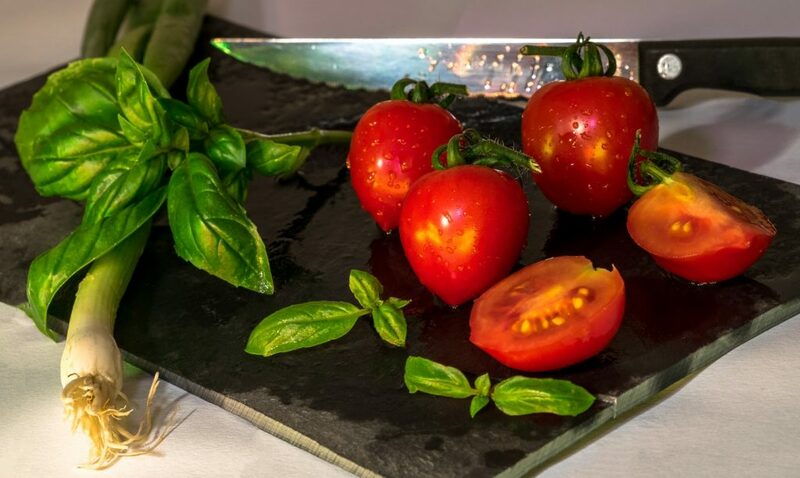 Cooked pasta with tomatoes, mozzarella and fresh basil would be a great side dish too. What Ever Will You Do With The Left Over Chicken? « Kitchen Tip #4 Think Big!